Synopsis: A divorced couple scheme to recover their pension fund which has been stolen from them by a villainous French banker. Spanning locations in Paris, London and the French Riviera, The Love Punch pairs Pierce Brosnan and Academy-Award winner Emma Thompson for the first time, as ex-husband and wife Richard and Kate whose sparring suggests that the flames of their former relationship have not been fully extinguished. Unfortunately the same cannot be said for their retirement nest egg which is wiped out when Richard’s investment firm is defrauded and the pension fund is siphoned away. The Love Punch finds Kate and Richard – legally uncoupled but still financially shackled by pensions and investments – seeing their daughter off to university. Kate is a lecturer who is developing a new online relationship. Richard is days away from retirement, looking forward to days filled with golf, when he discovers that a ruthless French businessman has bought his finance company and syphoned off not only his pension fund but the entire financial future of his employees. 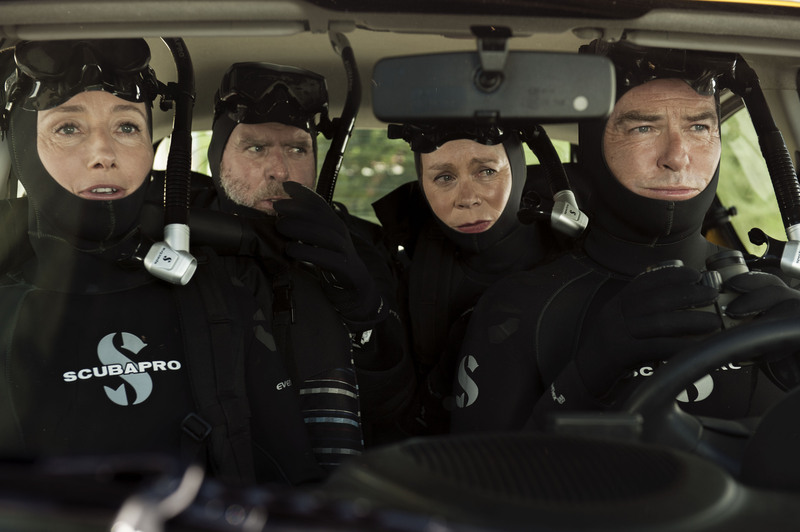 The pair hatch increasingly hair-brained plots to recover the money in France, including a diamond heist at a wedding on the Côte d’Azur with their best friends and neighbours, Jerry (Timothy Spall) and Pen (Celia Imrie) in tow. Actors of this calibre can convince in anything but they struggle with this turgid script – more bromide than sparkling champagne – from writer-director Joel Hopkins (Last Chance Harvey). The ground covered in The Love Punch has been more amusingly trod in films like It’s Complicated and in the diamond heist caper plot of myriad greats such as To Catch a Thief, Topkapi, Gambit and when Brosnan’s Richard exclaims at a Paris breakfast ‘This isn’t the Pink Panther’ – you wish it was. There is something so wrong about watching Emma Thompson and Pierce Brosnan talk about bad backs, ageing jokes and reading glasses and the sub plot involving their eccentric neighbours is beyond belief. Bizarrely best friend Jerry has had a secret James Bond-type derring-do life unbeknown to any of them – especially his wife Pen. Its attempts to appeal to a wider, younger demographic – Kate’s online chats; her son’s computer hacking; Skype calls with predictable ‘scatological’ humour; plus Richard’s frequent social media cry of ‘Let’s Do This’ – fall badly flat. It’s hard to know what demographic The Love Punch is aimed at – its fate may be endless television repeats.